Morels are inevitably the most-sought after fungi in spring. Many a forager has ventured out several times a season only to be blanked. 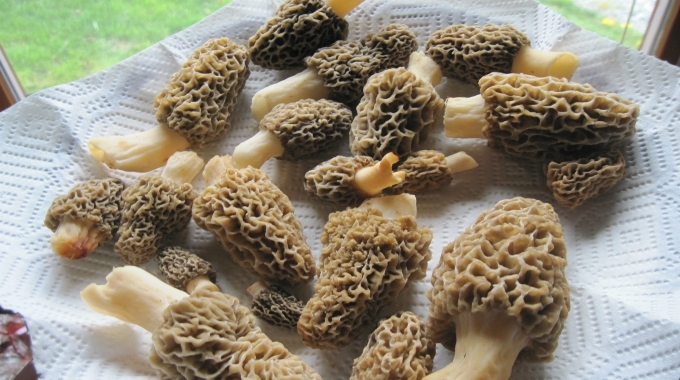 Finding morels can be difficult but there are some tips that may help you narrow your search. First, the best tip is weather. When you have a week of 10 degrees Celsius (50 degrees F) nights and some rain, this will help to get things happening. Morels appear when the ground temperature 10 cm (4″) below the surface reaches 12 degrees Celsius (55 degrees F) and they’ll stop fruiting when the ground temperature reaches 17 degrees Celsius (62 degrees F). Although not a steadfast rule, it sure is a good rule of thumb. Supposedly black morels can grow in soil temperatures as low as 8 degrees Celsius (47 degrees F). Next, look to the oak leaves. Many well-seasoned foragers like to go by the size of the oak leaves. When the leaves are the size of about a dime, then it is time to go morel hunting. Know your trees! Morels are most commonly found in forested areas around elm, sycamore, hickory, and ash. Morels like fruit too, especially old apple orchards. Morels love a burn site. Many commercial foragers will fly to an area in which there have been forest fires; and they return with boxes full of morels. Morels thrive on the nutrients that burned trees release back into the soil. Concentrate on well-drained areas that receive plenty of rainfall, but don’t necessarily hold it. Early-season morel hunters should focus on south and west facing slopes because these areas have the warmest, early season soil. They are found in grassy areas on occasion, but generally the higher humidity of the forest is going to encourage better growth. Morels can range from a shot glass size to almost a soda can size, but usually they are in the middle. Early season morels are often black and they seem to like sycamore trees. Gray, or yellow, morels generally appear later in the season. Morel mushrooms must be properly identified to be sure they’re safe to eat. There are “false morels” that grow at the same time and they resemble the real morels but their caps are round, brain-like in appearance and they’re poisonous. Never eat a false morel – and if you have the safe morels, never eat them raw! Always cook them. For identification check out the fungi page by clicking here. If you are fortunate enough to find a good stash of morels then your body will appreciate all the minerals and vitamins morels provide. A serving of 100 grams will give you over 50 percent of the daily requirements of vitamin D and almost 70 percent of the daily value required for iron. In addition, morels are a great source of vitamin B6, calcium, copper, magnesium, manganese, phosphorus, potassium, selenium, sodium and zinc. Hopefully these tips to find morels will help you bring these nutrient-dense mushrooms from the forest to your dinner plate. Thank you for the wealth of info!